Deramaxx, an FDA-approved coxib-class nonsteroidal anti-inflammatory drug (NSAID), is a daily treatment for dogs with pain and inflammation, caused by arthritis, osteoarthritis, or orthopedic surgery. Unlike many NSAIDs that block both the COX-1 and COX-2 enzyme, Deramaxx only blocks the COX-2 enzyme that triggers pain and inflammation. COX-1 enzymes aid in kidney function, blood clotting, and protect the lining of the stomach. 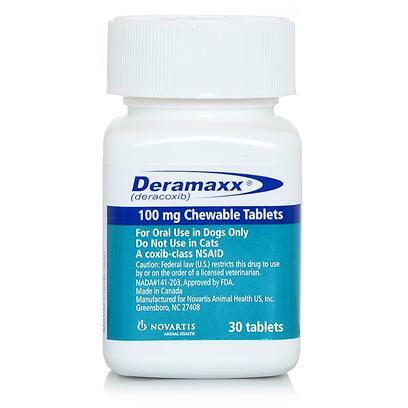 Deramaxx is available in beef-flavored chewable tablets is and intended for dogs 4 pounds and over. Deramaxx is not intended for the treatment of cats. The use of Deramaxx can affect the digestive system, kidneys, or liver; pets can display vomiting, diarrhea, color change or blood in stool or urine, decreased appetite, and behavioral changes. These symptoms are usually mild, but should be taken seriously; consult a veterinarian immediately if they occur. There may also be drainage or oozing at the surgical site, when Deramaxx has been taken to control postoperative pain. Administer Deramaxx at the veterinarian prescribed dose, once daily for arthritis pain, or once prior to operative procedure then daily up to 7 days.